Emailing is one of the best and fastest communication methods nowadays. It is free and reliable as well. We can contact a person who resides in another part of the world and send attachments which will be delivered within a few seconds. An email address has become essential to perform various kinds of online activities including website registration, banking, business, marketing, and others. The companies, clients, and even boss will contact you by email with any important update. So you need to check email accounts very frequently. But is it practical for you to open the computer always to read such messages? Nope. We need a smartphone app to check emails in traveling or when you are away from the system. 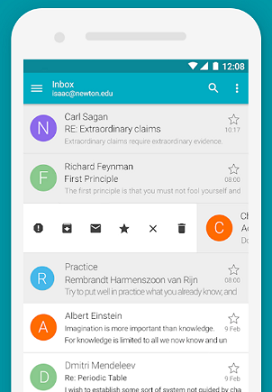 In this post, we list 11 best Android email apps. They are universal apps to check all your email accounts from a single dashboard. Do you think we missed your favorite email app? If so, feel free to share your feedback through the comment form below. Blue Mail is my favorite email client. 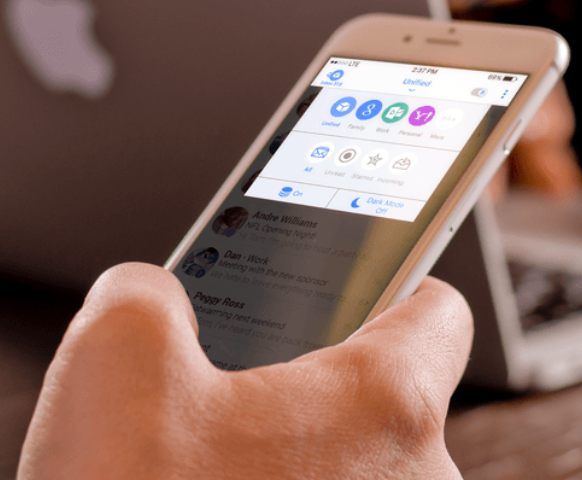 It supports a wide range of networks and protocols like Gmail, Yahoo, Outlook, AOL, iCloud, Office 365, Google Apps, Hotmail, Live (Live.com), Yandex and IMAP. Smart mobile notifications. Set quiet hours, custom sounds and other preferences easily for each account. Aqua is an email client that integrated with popular emails- Gmail, Yahoo, Hotmail, FastMail, Apple Mail, AOL etc and standard protocols like IMAP, POP3, multi-service, SMTP as well as Microsoft’s EWS. K-9 Mac multi-service is another email app in open source format. It means you can contribute to the source code of the app and make it better. K-9 offers support to the various mail services including Gmail, IMAP, POP3, Exchange 2003/2007 and more. MailDroid is another email client where you can check emails from Hotmail, Outlook, Yahoo, AOL, FastMail, GMX etc and IMAP, POP services. TypeApp is a top-level email app for Android phones and tablets. It allows you to check Gmail, Yahoo, Exchange, AOL, iCloud and other accounts on IMAP, POP3 protocols. 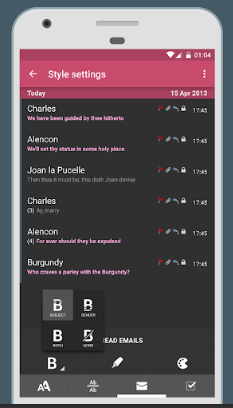 You can configure each and every part of the app including appearance, menu, notifications, inbox style and much more. 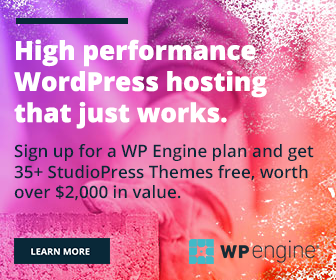 Connected with several services like alesforce.com, Zendesk, Pocket, Evernote, OneNote, Todoist, Trello, Asana, and MailChimp. SolMail is beautifully designed mail application which supports several accounts including Gmail, Yahoo, AOL, Outlook, Hotmail and other IMAP/POP3 clients. myMail is another app to check all your emails from a single place. It supports Gmail, Yahoo, AOL, Outlook, Hotmail, iCloud, Mail.com, and Apple accounts. 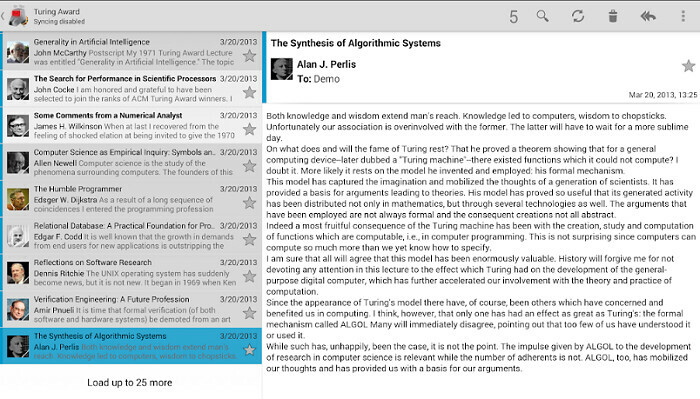 Nine is one of the popular email apps for Android. It has a beautiful interface, excellent features but sadly it doesn’t have support to Gmail. Nine supports email services like Office 365, Exchange Online, Hotmail, Live.com, Outlook, MSN and Google Apps. 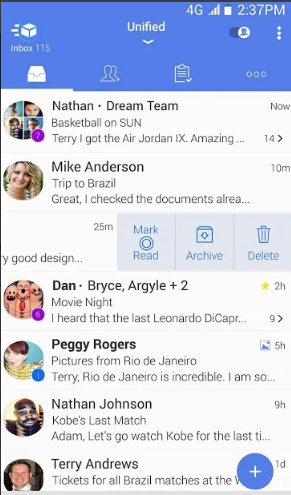 Email is an elegant, fastest universal mail app for Android devices. 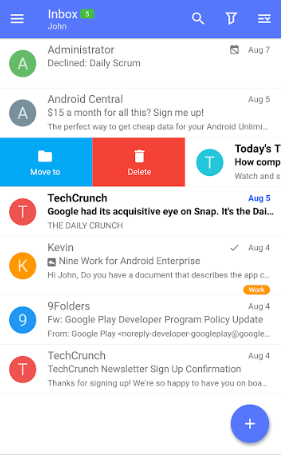 It is a great option to replace the stock email app on your device. Email allows you to check messages from unlimited mail accounts on Gmail, Yahoo, AOL, Exchange, Outlook, Hotmail, Office365 and IMAP accounts. 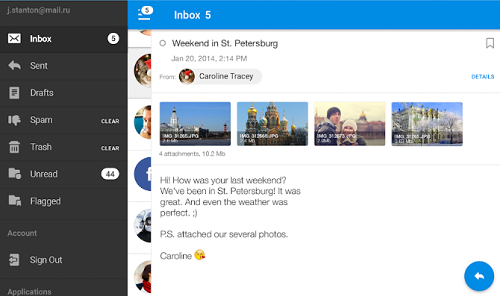 Mail.Ru is a powerful email client that lets you check all emails in one place. It works with Gmail, Yahoo, Hotmail, Mail.Ru and other accounts.